When a beautiful piece of tenderloin is the focal point of your Christmas feast, little else is needed. But we did anyway. It was Christmas, after all. Before sitting down to this scrumptious feast, we had a wonderful variety of cheeses and spreads . . . and plenty of wine. Then, in addition to the perfectly cooked beef, we had roasted broccoli, new potatoes, corn casserole and a Brussels sprouts and arugula salad. I forgot to take a picture of the oh-so-perfectly rich triple chocolate cheesecake. My sister's annual fete for the five siblings in our family, appropriately dubbed "Sibling Christmas," was just a perfect blend of foods -- color, texture, variety. Casually elegant. It's become a favorite new tradition among us. Lynn is a most gracious hostess, the kind that can not only create a great meal but makes you feel both comfortable and special at the same time. She carefully plans menus and just may be the only person I know who keeps as many, and as much a variety of, cooking resources as I do. Many of the recipes I write about here have come from her testing; and I trust her instincts implicitly. I was surprised, then, to learn that she doesn't really care for Brussels sprouts. Kale? Yes. Broccoli? Definitely. All kinds of vegetables. Just not Brussels sprouts. 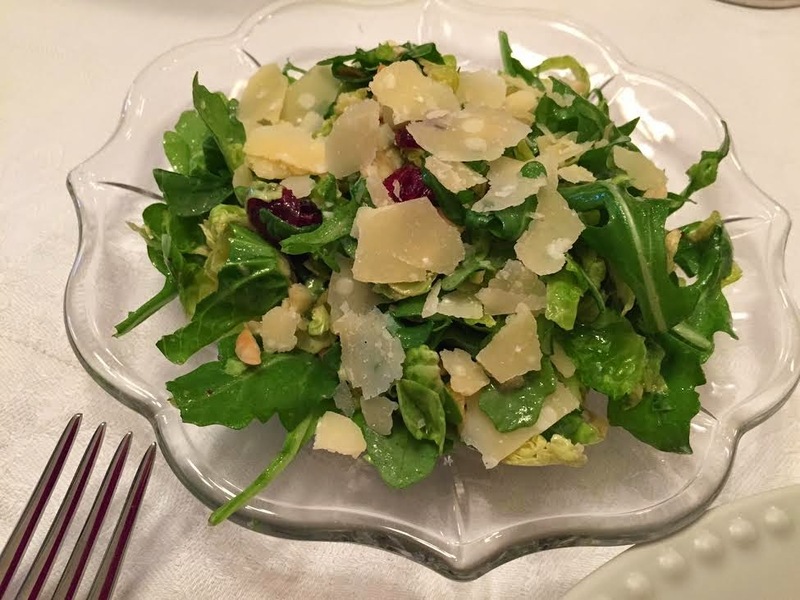 So when I volunteered to bring a Brussels sprouts and arugula salad to our family dinner, she was elated. She was going to roast some sprouts herself because she knew so many of us liked them, but grateful that someone else was taking over the "B" sprouts. And she further surprised me by saying afterwards that she really liked the salad. I also learned that she doesn't really like raw tomatoes. No wonder she gets along well with Mr. Rosemary! Lynn had asked me to bring a salad and I went through my files looking for just the right one. That meant magazines, cookbooks, clippings, hand copied index cards and the internet. After all that searching, nothing was quite right. So I pulled pieces together from Food 52, Williams Sonoma, Giada DeLaurentis and Family Day. And the salad I came up with is below. It's a repeat. Mix the mustard, maple syrup and vinegar. Slowly add the oil, whisking until it emulsifies. Season with freshly ground black pepper and kosher salt as you like. I've recently fallen in love with brussels sprouts, too. And I'm always happy to hear that I'm not the only person who can't eat raw tomatoes! I was surprised I liked than raw, Uru. But they're good!